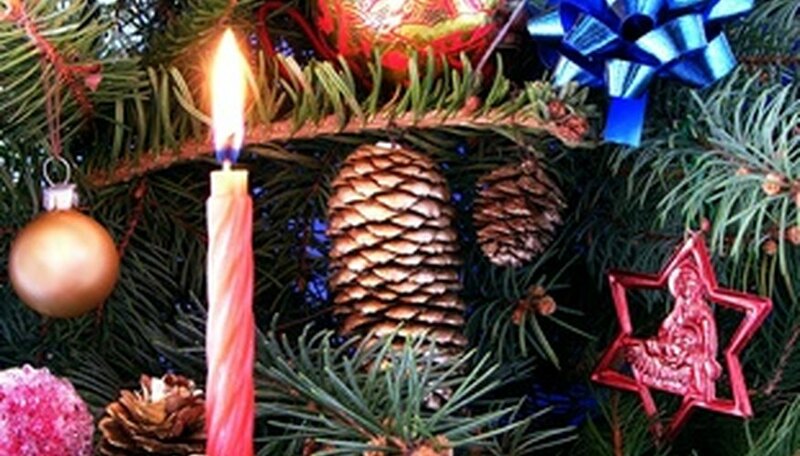 Like many Christmas traditions in the Christian faith, the Advent wreath is pagan in origin. Christian churches light a candle each Sunday during the four weeks leading to Christmas. Some families make their own Advent wreaths to light at home. It is not known when the first Advent wreath was created. Pagan rituals often included lighting candles in a wreath to signify hope for the return of the sun in the midst of winter. In the Middle Ages, Christians borrowed this ancient custom and incorporated it into the celebration of Christmas. The Catholic and Lutheran religions were among the first to formally adopt the Advent wreath. The Advent wreath is made of evergreen boughs, symbolizing everlasting life. The circle represents the continuous love of God, with no beginning and no end, as well as the soul's immortality. Each of the four colored candles in the Advent wreath represents a week leading to Christmas. Traditionally, three of the candles are purple, and one is pink. The final candle is white and is located in the center of the wreath. It is lit on Christmas Eve or Christmas Day. It was once a tradition for the pope to give someone a rose on the fourth Sunday of Lent before Easter to "liven up" the somber tone of the season. Before the mass commercialization of Christmas, Advent was also a solemn time, as people fasted to prepare for the holiday. The rose custom became part of the third Sunday of Advent. Eventually, the third candle turned pink as well. The candles are traditionally lit in the following order: purple, purple, pink, purple, white. The first is called the "Candle of Hope." It symbolizes faith in God keeping his promises to humanity. The second is called the "Candle of Preparation," reminding Christians to "get ready" to receive God. The third candle is the "Candle of Joy." It recalls the angels joyfully singing about the birth of Christ. The fourth candle, the "Candle of Love," reminds Christians that God loves them enough to send his only Son to Earth. The "Christ Candle," the white candle in the center, stands for Jesus Christ himself. Some Christian faiths encourage families to light a candle on the wreath every day during Advent, followed by Scripture readings, songs and prayer. During the first week, one candle is lit each day. During the second week, two candles are lit, and so on. There are many interpretations of the Advent candles. Some believe the candles stand for Hope, Love, Joy and Peace. Some light the pink candle on the last Sunday before Christmas instead of the third. Some use four purple candles. In all traditions, the symbolism is steeped in the Christian faith.